A wide range of uses were found for fenugreek in ancient times. Fenugreek was, and remains, a food and a spice commonly eaten in many parts of the world. Fenugreek seeds contain alkaloids (mainly trigonelline) and protein high in lysine and L-tryptophan. Its steroidal saponins (diosgenin, yamogenin, tigogenin, and neotigogenin) and mucilaginous fibre are thought to account for many of the benefits of fenugreek. Fenugreek Seed - capsule: Vegetable hypromellose (HPMC). Take one capsule up to 3 times per day swallowed with water. Should not be used during pregnancy or if taking heparin or warfarin. 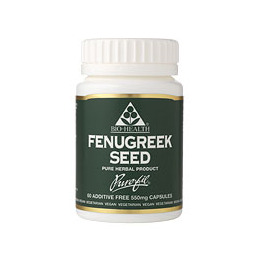 Below are reviews of Fenugreek Seed - 60 x 550mg by bodykind customers. If you have tried this product we'd love to hear what you think so please leave a review. Fantastic little herb if I must say! I have been using Fenugreek seed to increase my breastmilk supply and it does wonders. When my supply becomes low I start taking these tablets, and within 24 hours, usually, my breasts seem full again - sometimes you will get an over-supply but better than an under-supply! I take in total 7 tablets a day, until my supply is back to normal and then cut down to 2. You may find that you begin smelling like fenugreek soon lol but for me, my childs nutrition is more important. The best value - bodykind, and suitable for vegans too. These caps are just fab - I have used them for more than a year now, mainly used to help with my milk supply as I am breastfeeding my child. At first I started taking one a day, and then increased to two. My milk supply was increased within days and I only take them when I feel my supply has decreased now. I am buying another pack, as I am due my 2nd child soon, and will defiantly be using these again. Would recommend any day! Fenugreek seeds contain alkaloids and protein high in lysine and L-tryptophan. Its saponins diosgenin, yamogenin, tigogenin and neotigogenin and mucilaginous fibre are thought to account for many of the benefits of fenugreek.